People walk through the morning market in Ubud just as the sun starts to come up. 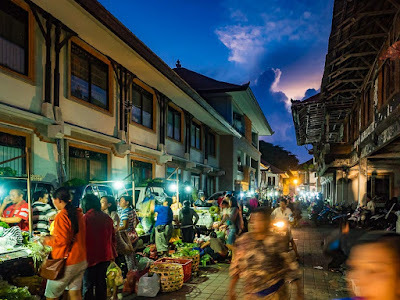 Most people who come to Ubud see the tourist market in the center of the town loaded with knickknacks, ukuleles, tiny surfboards and tropical kitsch and don't realize there is also a thriving local market at the same place much earlier in the morning. 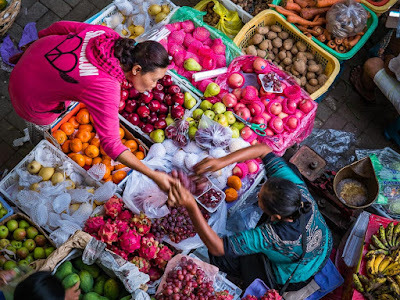 Buying fruit at the morning market. You have to get up very early to see the morning market. Like 4.30AM early. I walked up to the market from our Ubud hotel about 5AM and it was packed - not a stall was empty. Market vendors were hustling to sell fresh off the farm produce while shoppers hustled to get the best deals. The best part, for me, was that I was the only non Balinese person there. 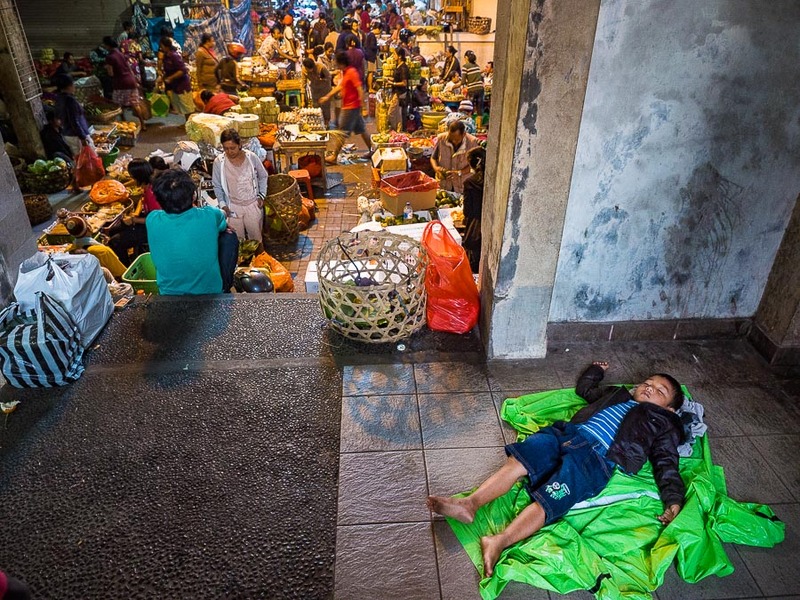 It was a chance to see Balinese people going about their daily lives in a very real way. Part of the morning market. Nearby a child sleeps in a stairwell. 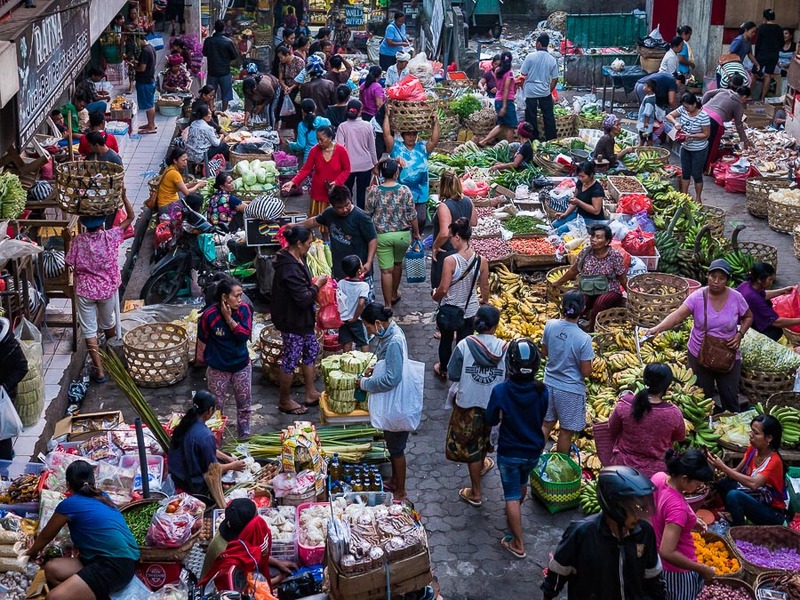 The Ubud morning market opens about 4.30AM and starts closing about 7AM. It doesn't really close though as much as it transitions. The produce and food stalls in the market close up, but they're replaced almost as soon as they close by stalls selling tourist kitsch. 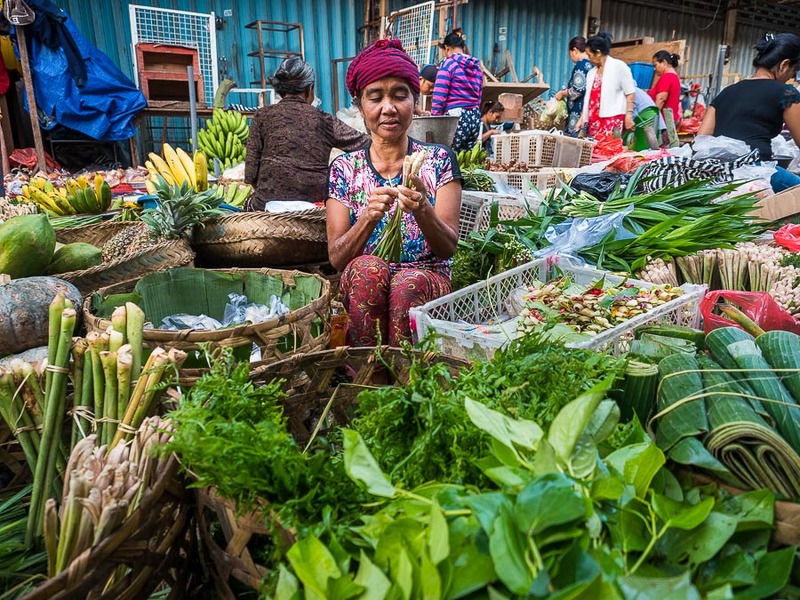 A produce vendor in the morning market. By 8.30AM this part of the market is shops selling sarongs and souvenirs. There are more photos from the Ubud market in my archive. NOTE: My blogging schedule has been thrown off by recent events in Thailand. These posts are dated by when I did the photography. I will have more on recent events in Thailand soon.